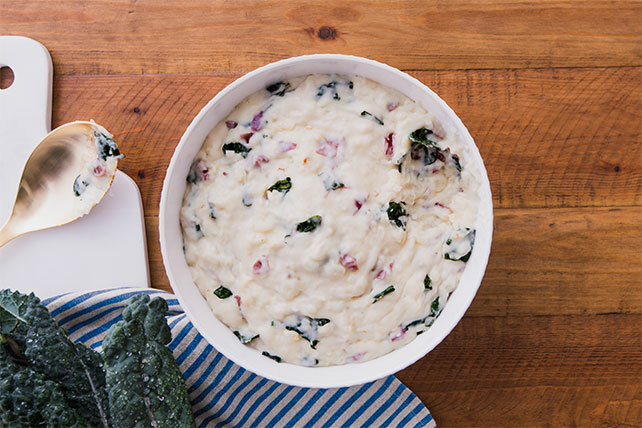 Make mashed potatoes even tastier by making them kale mashed potatoes! Sour cream, garlic cloves, Italian cheese, chicken broth, butter and coarsely chopped stemmed kale adds lots of taste to Creamy Garlic and Kale Mashed Potatoes. Bring broth to boil in large saucepan. Add potatoes; stir. Return to boil; cover. Simmer on medium-low heat 15 min., stirring after 8 min. Uncover; simmer 5 to 6 min. or until potatoes are tender and most the broth is absorbed. Meanwhile, heat oil in medium nonstick skillet on medium heat. Stir in kale and garlic; cook and stir 3 to 5 min. or until tender. Add sour cream and butter to potatoes; mash to desired consistency. Stir in cheese and kale. Prepare using KNUDSEN Light Sour Cream. Substitute 4 cups fresh baby spinach leaves for the chopped kale.